Haeckel's embryo drawings. The top row has been faked and the four right-hand collumns are all from the same taxonomic subclass Eutheria (Placental mammals). From Georges Romanes's book Darwinism Illustrated (1892). The theory of recapitulation was an attempt to apply embryological similarity (homology) in support of Darwinian common descent. 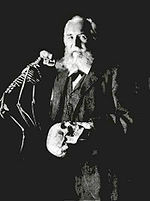 The theory was put forth in 1866 by Ernst Haeckel who coined the phrase ontogeny recapitulates phylogeny to describe the view. Haeckel suggested that gill slits and a tail could be seen during embryo development in organisms that did not possess them as adults. It was asserted that these organism must have possessed structures during their evolutionary history that were lost in adult stages due to natural selection. His theory held that organisms progress through stages in their evolutionary history during embryo development—a theory that also became known as the Biogenetic law. Ontogeny is the development of the organism. Phylogeny is the evolutionary history. It is important to note that the gill slits are not slits at all, but merely the folds in the region of the embryo’s throat that are never involved with gas exchange (O2 / CO2), which is accomplished by the umbilical cord. These folds, now called pharyngeal arches, later develop into the outer and middle ear as well as the bones, muscles, nerves, and glands of the neck. The appearance of an embryonic tail is simply due to the rapid growth of the spinal cord causing it to become longer than the body, and forcing the body to curl. This curling contributes to the folds visible in the neck region, in the same way a person develops a double chin when bending the neck forward. In an attempt to prove his theory true, Ernst Haeckel committed one of the most infamous examples of scientific fraud. 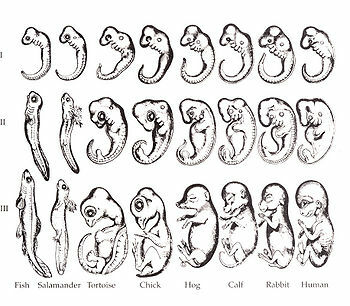 In 1868, he published the series of embryos in the picture at right showing various living things placed side by side in the attempt to give the impression that there was significant similarity among them. The embryos shown in the earliest stages were altered to make them look more similar than they are in actuality. Embryologist Jonathan Wells notes that Haeckel was also very selective about the embryos he chose for his illustration. The four right-hand columns in the diagram at right are all from the same taxonomic subclass Eutheria (Placental mammals). Marsupials and monotremes were excluded, as were cartilaginous fish (sharks) and others. The fraud was exposed only months following the publication of these engravings by L. Rütimeyer, professor of zoology and comparative anatomy at the University of Basel, and corroborated by other contemporaries such as William His Sr, professor of anatomy at the University of Leipzig, who published their own comparisons showing significant differences (picture at left). Comparison of a human and a pig embryo by Wilhelm His (1891) showing remarkable difference contradicting Ernst Haeckel's biogenetic law. In 1997, the full extent of Haeckel's fraud was brought to light when Michael K. Richardson, a lecturer and embryologist at St George’s Hospital Medical School, London, published photos of actual embryos illustrating the discrepancies between Haeckel's popular diagram and genuine embryos. Richardson described the situation in an interview in Science magazine as follows: It looks like it's turning out to be one of the most famous fakes in biology. [note 1] The study was published in other science journals. The effort involved an international team of embryologists who examined and photographed "the external form of embryos from a wide range of vertebrate species, at a stage comparable to that depicted by Haeckel" because up until that time it was apparent that "no one has cited any comparative data in support of the idea". They analyzed 39 different animals including those published by Haeckel and many that were not, such as marsupials, tree-frogs, snakes, and alligators, and they found significance differences with little conservation at the stage of development Haeckel claimed was most similar. In fact, the species in the fraudulent publication are so different that it is assumed the drawings made by Haeckel could not possibly have been done from real specimens. Despite the early exposure of this fraud by his contemporaries and following the almost universal recognition by the scientific community, Haeckel’s embryo comparisons continue to appeared in textbooks in support of common descent. Examples of recent use include the 2004 edition of Biology: The Unity and Diversity of Life by Starr and Taggart., and the 1992 edition of Biology, a college level introductory biology text that states: "In many cases the evolutionary history of an organism can be seen to unfold during its development, with the embryo exhibiting characteristics of the embryos of its ancestors. For example, early in their development, human embryos possess gill slits like a fish..."
↑ In a publication of 2009 Robert Richards re engineered the Richardson's photographs of embryos removing the yolk material and changing the orientation of some photographs in an effort to demonstrate that the fraud was not proven. However even with the yolk material removed the embryos are quite different and barely resemble the drawings of Haeckel. Remarkably the examples of embryos of the salamander and the fish in Richards' re engineered photos are completely different than what was illustrated by Haeckel. It takes a superhuman effort to consider that are even barely similar. in Richards, Robert J. (November 5, 2008). "Haeckel’s embryos: fraud not proven". Biology and Philosophy (Springer Science+Business Media B.V.) 24: 147-154. ISSN 0169-3867. http://home.uchicago.edu/~rjr6/articles/Haeckel--fraud%20not%20proven.pdf. ↑ Wells, Jonathan (2000, 2002). Icons of Evolution: Science or Myth?. Washington, DC: Regnery Publishing. p. 81-109. ISBN 0-89526-200-2. ↑ Wells, Jonathan. The Politically Incorrect Guide to Darwinism and Intelligent Design, p.26. Regnery Publishing, Inc. 2006. ↑ Batten, D., Catchpoole, D., Sarfati, J., Wieland, C. The Creation Answers Book, p.113-114. Creation Book Publishers. 2007. ↑ Pennisi, Elizabeth (September 5, 1997). "Haeckel's Embryos: Fraud Rediscovered". Science (American Association for the Advancement of Science) 277 (5331): 1435. ISSN 0036-8075. http://www.sciencemag.org/content/277/5331/1435.1.full. ↑ Sarfati, Jonathan (1999). Refuting Evolution. Green Forest, AR: Master Books. p. 85. ISBN 0-89051-258-2. ↑ Raven, P.H. and Johnson, G.B., 1992. Biology (3rd edition), Mosby–Year Book, St. Louis, p. 396. ↑ 13.0 13.1 13.2 13.3 13.4 13.5 13.6 13.7 13.8 13.9 Luskin, Casey (03-27-2007). "What do Modern Textbooks Really Say about Haeckel's Embryos?". http://www.discovery.org/a/3935#text5. Retrieved 12-26-2012. ↑ 14.0 14.1 14.2 14.3 14.4 14.5 14.6 14.7 14.8 14.9 "New York Times Rehashes Darwinist Myths about Haeckel's Embryo Drawings and Evolution". http://www.evolutionnews.org/2008/08/new_york_times_rehashes_darwin010611.html. Retrieved 12-26-2012. ↑ Mayr, Ernst (2001). What Evolution Is. New York: Basic Books. p. 28. ISBN 0-465-04425-5. ↑ "Featured Topic 10/09: Evolutionary PRATTs". http://domain-of-darwin.deviantart.com/journal/Featured-Topic-10-09-Evolutionary-PRATTs-229971805. Retrieved 12-26-2012. ↑ Alberts, Bruce; Bray, Dennis; Lewis, Julian; Raff, Martin; Roberts, Keith; Watson, James D. (1994). Molecular Biology of the Cell (3rd ed.). New York & London: Garland Publishing. p. 33. ISBN 0-8153-1619-4. Does The Human Embryo Go Through Animal Stages? by John D. Morris, Ph.D., Institute for Creation Research. Ernst Haeckel: Evangelist for evolution and apostle of deceit by Russell Grigg, Creation 18(2):33–36, 1996. Hoax of Dodos: Flock of Dodos Filmmaker Claims Haeckel’s Embryo Drawings Weren’t in Modern Textbooks—But He Knows Better By John G. West, Ph.D. and Casey Luskin, M.S., J.D., Discovery Institute. Unseating Naturalism: Recent Insights from Developmental Biology by Jonathan Wells, Ph.D. This page was last modified on 7 November 2017, at 16:38.